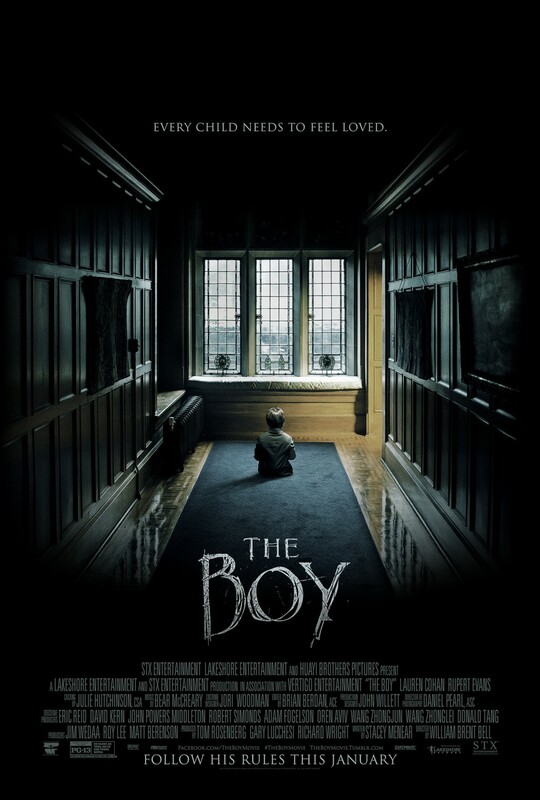 The Boy (2016) is new horror movie that begins like Child’s Play (1988) and ends like The People under the Stairs (1991). That’s a pretty original narrative as far as ‘hybrids’ go, and without giving too much away, I didn’t see the film’s last act twist coming at all. Delightfully, The Boy’s ending tracks remarkable well with the film’s first two acts, and makes a re-watch imperative so as to register all the bread crumbs. Also -- and I readily admit my bias here -- I simply love horror movies in which the filmmakers provide a set of rules for managing something monstrous or supernatural, and then proceed to have their protagonists ignore those rules. This creative technique preps the audience for terror, and gives it sign-posts to follow. In Joe Dante’s Gremlins (1984), of course, the mischievous Mogwai possess just three rules that must be obeyed, and all three get broken in short order. The Boy provides a whole laundry list of rules (on a clipboard, no less…) for the proper handling and care of an apparently diabolical porcelain doll named Brahms. 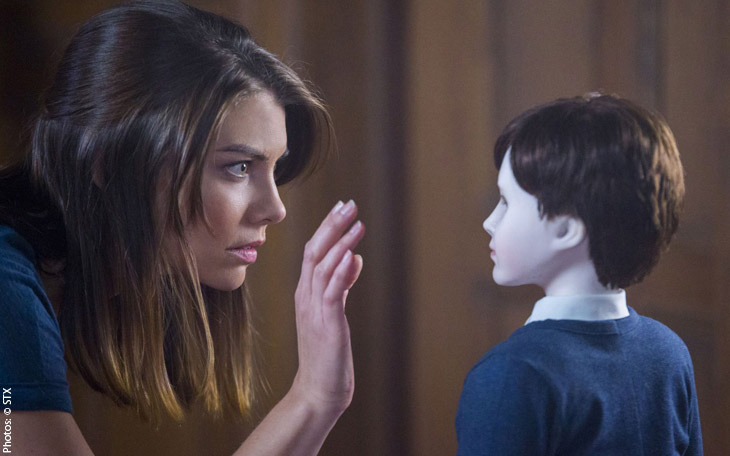 The film’s protagonist, Greta Evans (Lauren Cohan) promptly violates them, with escalating terror as a result. Like Krampus (2015), which I reviewed a couple weeks back, The Boy features a nice retro flair or style. The film isn’t overly serious or broody, the washed-out, sanitarium-green palette of modern horror has been eschewed, and the filmmakers are clearly not afraid to flirt with the idea of fantasy, or the supernatural, in a way that permits for humor and imagination. 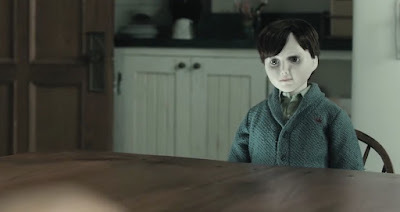 The Boy is exceptionally well-crafted, and one scene -- involving a “crying” doll -- provides the perfect symbolism for the film’s central conceit, and the lead character’s desire to believe in that which is patently unbelievable. 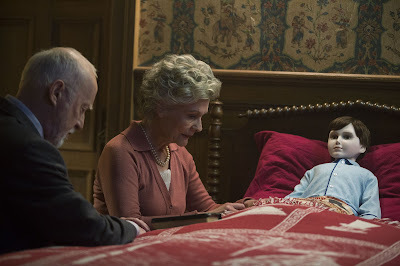 To the film’s credit, The Boy makes us believe in the unbelievable too, before pulling back the curtain to reveal the truth in a savage and surprising final act. Hiding a tragic history from her own past, American Greta Evans (Cohan) accepts a job as the nanny of young Brahms Hillshire. However, when she arrives at the Hillshire’s magnificent country estate in Great Britain, she learns that the boy is actually…a doll. Strangely, Brahms’ parents treat the large porcelain object just like he is a living being, and insist that Greta do so as well. For Brahms can be a very naughty boy, you see, if he isn’t respected. As the Hillshires prepare to go away on a long holiday, the couple provides Greta a set of rules for the proper care and treatment of the inanimate object. Brahms likes to be read to. He likes his music played at a certain volume. He needs a kiss every night before bed. And Brahms doesn’t like it at all when he is left alone, or if something is put over his head, like a blanket. Creeped out by the unblinking doll, Greta immediately disobeys Brahm’s rules once on her own…and soon learns the truth about this young man. In my introduction above, I wrote about how much I love horror movies that feature rules, and the violation of those rules. This concept is actually a key one in terms of the horror cinema. It involves, not surprisingly, transgression. In films like Gremlins or The Boy, everything will be fine if only the rules are obeyed. But whether through accidents or intentional disobedience, the rules are not obeyed, and all Hell breaks loose. I believe this is a basic, universal, human fear being expressed in films of this type. Perhaps it is a fear of the law itself; or the (conservative) notion of staying in line, obeying society’s edicts, moral and legal, lest something terrible happen. The fear here is of repercussions and damage to society and one's self if rules cannot be agreed upon and followed. Similarly, the ‘rules’ scenarios speaks to the notion that humans inherently don’t like rules. We question rules, we work around rules. We circumvent them any way that we can if we find them unappealing or unacceptable. We evade rules, or somehow think they don’t apply to us, or that we won’t get caught by them. Horror movies prove all these ideas absolutely wrong. Be a rule-breaker and the law -- even supernatural law -- will catch up with you. As these films remind us rules -- nature’s rules, man’s rules, God’s rules -- exist for a reason, including, at times, self-preservation or self-protection. To transgress, to violate the rules, is to invite blow-back. This is the explicit terrain of The Boy. From almost the exact moment that the Hillshires’ leave on their holiday, Greta starts breaking the rules intentionally. She drops the pretense, immediately, that she will take care of Brahms. She sits him roughly on a chair, and throws a blanket over his head. She doesn’t change his clothes, feed him, read to him, kiss him goodnight or do anything that is on the list. As you might expect, Brahms doesn’t like Greta’s approach and begins to misbehave. In some ways, this period of mischief is the film’s best section, as Brahms appears to move about the house, almost on the periphery of Greta’s sight. He isn’t where he is supposed to be, in one scene, and his head is turned in the wrong direction in another. The only occasion in which the audience actually sees Brahms move happens in Greta’s nightmares, setting up classic “stay awake” moments in which she awakens screaming. Greta comes to believe -- and eventually wants to believe -- that Brahms is a spirit, or some supernatural entity. A terrible trauma in her past makes her want this to be so, very badly. Here, The Boy grapples with nothing less than the idea of human, mortality, and the intense desire to believe in an afterlife. The existence of a living doll (one inhabited by a spirit...) promises that our existence doesn’t stop at death. Greta, who lost someone precious, starts to care for Brahms when she realizes what he might represent: an acknowledgement that the impossible is possible. If Brahms can live inhabiting a doll, perhaps the person she lost also lives on in some form. But the movie comes down on the side of reality and science, not the supernatural or delusion. There is a rational explanation for Brahms’ actions, but one that is not plain to see until the last act twist. In other words, man often convinces himself that he is seeing “signs” of the supernatural when he or she is, in fact, merely misinterpreting the natural world. One scene perfectly captures this idea. Greta sees Brahms sitting in a room. She crosses the distance from the door to his chair, where he is seated, and the audience sees a tear dripping down his cheek. In disbelief, Greta touches his cheek, and finds it wet. At first, she believes this is evidence of her belief system. Brahms is alive. He’s crying real tears. And then the curtain gets pulled away and we see the truth. The country estate is damaged, and requiring repair. There’s a leaky ceiling. Water drops are falling from that ceiling onto Brahms’ cheek. So, what appears to be magical fantasy or superstition is actually just part of the natural world. Watch the film, and you can see how the filmmakers apply this idea to Brahms’ overarching story. It’s quite a nice conceit -- one predicated on careful misdirection -- and it sells the movie’s concept in a single, simple scene. The imagery provides us the clue to an understanding of Brahms’ real nature. 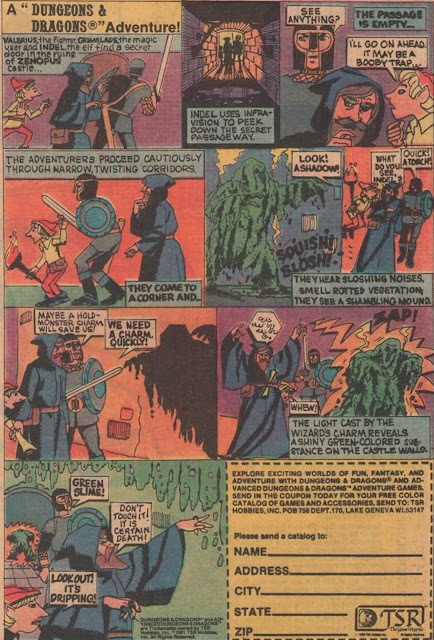 One can see how the same equation (appearance: supernatural/reality: natural) can be applied to a number of events in the narrative, including the moment when the doll apparently locks Greta in the attic. As one character notes in The Boy, there’s a difference between polite talk and pub talk. The polite talk about The Boy might be that it is a mildly clever pastiche of other horror films that trends, at times, towards, silliness. The pub talk, on the other hand, may be more accurate and valuable in describing The Boy. It’s one hell of a scary and entertaining ride. John your review of The Boy is spot-on, one scary ride.